← Let the Lion Out! In my role at Heritage, I travel to speak at a different church most every weekend. One disheartening trend I’ve noticed is the fact that so few people are looking at their own copy of the Scriptures (printed or electronic) while I’m preaching. In some cases, the reason for the lack of open Bibles is that we’ve unintentionally discipled people not to bring a Bible to church. 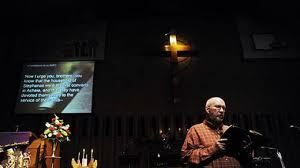 We’ve trained people not to bring a Bible to church by displaying the sermon passage on the screen. Why open a Bible when it’s projected on the big screen? We’ve also taught people that Bibles are optional by preaching sermons that are only marginally tied to Scripture. Why open a Bible when it’s not being examined or exposited? Retraining our people to bring and open their Bibles at church will take some intentionality. Here are several ways pastors can work to develop an “open Bible” culture in their congregations. First, be wise in the Scripture you choose to project on the screens or print in the bulletin. Do project the verses you select for the public reading of Scripture – a necessity in this day of multiple translations. Don’t put the main Scripture text for the sermon on the big screen. Instead, display only the correlative verses that are mentioned during the message. Second, make Bibles available to those who don’t have one when they arrive at church. 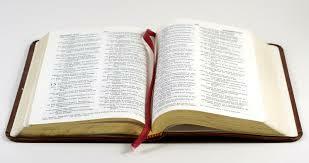 Encourage people to open to the passage for the message by telling them the page number in the Bibles you’ve provided. This will help the uninitiated find the passage without feeling foolish and will emphasize your desire to have Bibles open during the message. My continual advice to beginning preachers is, “Quote the text! Quote the text!’” Say the actual words of the text again and again. Show the people where your ideas are coming from.’ Most people do not easily follow the connections a preacher sees between his words and the text. They must be shown again and again with actual quotes from Scripture (The Supremacy of God in Preaching, p. 86). If we want people to open their Bibles at home during the week, we can start by getting them to open them on Sundays at church.